With the increase in the production of electronic appliances and diversity-seeking consumers, hazardous electronic wastes production has challenged field of waste and environment management because electronic wastes like scrap PCB boards have caused environment pollution without proper treatment. However, e-waste also has large recovery rate. As we all know, some high quality PCB board has much gold, silver on it, like cellphone boards and computer boards. As the leading company who is dedicated to designing and producing e-waste recycling equipment, we have launched electronic waste precious metal separation & refinery exacting and recycling solution to sort, refine, extract and reuse the precious metal like gold, silver, palladium(Pd) and platinum(Pt) from e-wastes that contain noble metal chip component and anode slime. The fineness of precious metal can reach up to 99.99%. The equipment of e-waste recycling plant can be used to recycle all kinds of circuit boards, computer board, TV board, aluminum-plastic plate, copper board and printed circuit boards to make further economic benefits. As a matter of fact, there is much metal in circuit boards, for example, copper(about 40%), gold, silver and nickel. The proportion of gold,silver in printed circuit board is much more than that in gold ore mineral. Actually, there are many resources of e-waste containing precious metal in daily life, such as waste mobile phone circuit board, computer CPU, motherboard, VCD, CD, television board, game machine, fax machine, telephone board, mobile communication and other kinds of home appliances, industrial offal in electroplate factory, electronic parts and components factory, printing house, photosensitive material factory and electronic equipment factory, etc. Two times mechanical pulverization makes PCB into the mixtures of metal and nonmetal powder. The air separation technology can realize the metal and non-metal complete separation and collection. The whole process can be realized in one production line, fully closed operation can ensure not creating any pollution. For instance, in the process of gold stripping, we use our patent chemical to strip gold from PCB surface, and extract gold from solution, which has no acid and some other harmful material for worker and environment. 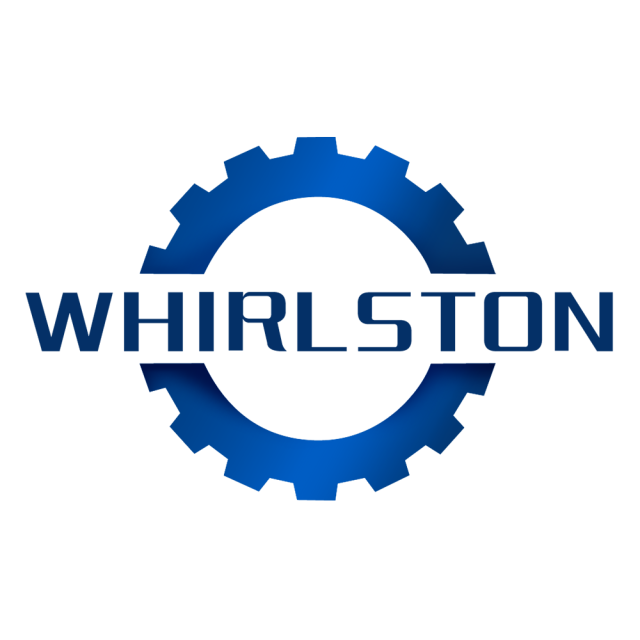 The equipment are easy to operation and use. After proper treatment, waste water can achieve up-to-standard discharge. The recycling rate of precious metal (gold, silver, palladium and platinum) can reach up to 97% – 99%. The purity of precious metal is up to 99.99%. The operation process of E-waste precious metal recycling production line is with high degree of automation, saving human cost to a large extent. 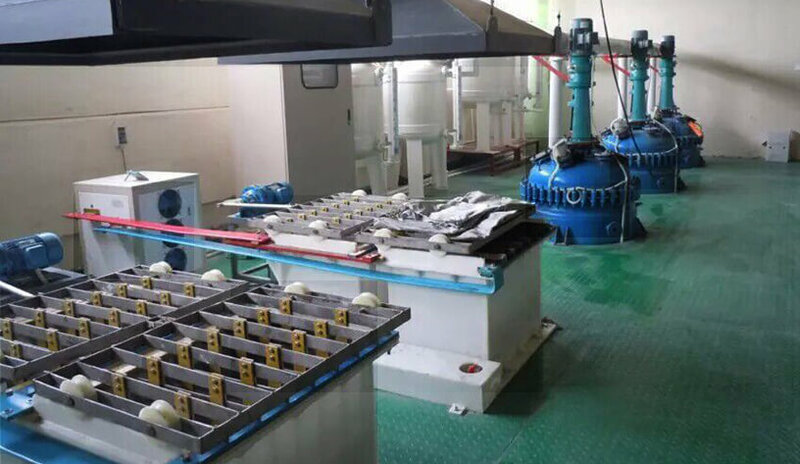 Adopting cyanide-free environmental protection hydro-metallurgy technology, the processing flow is short, greatly reducing the pollution to environment. Chip, South and North Bridge chip set, memory chip and integrated circuit that cannot return after disassembling are the components conforming to uniform processing, and the elements with collective materials containing the highest gold and silver content. People use the ozone addition method to roast (ozone can thoroughly destroy the harmful flue gas caused by burning), and adopt the soluble carrier, leaching copper, Pb-Sn and hydrochloric acid medium to leach and extract gold, platinum and palladium from roasting residue. 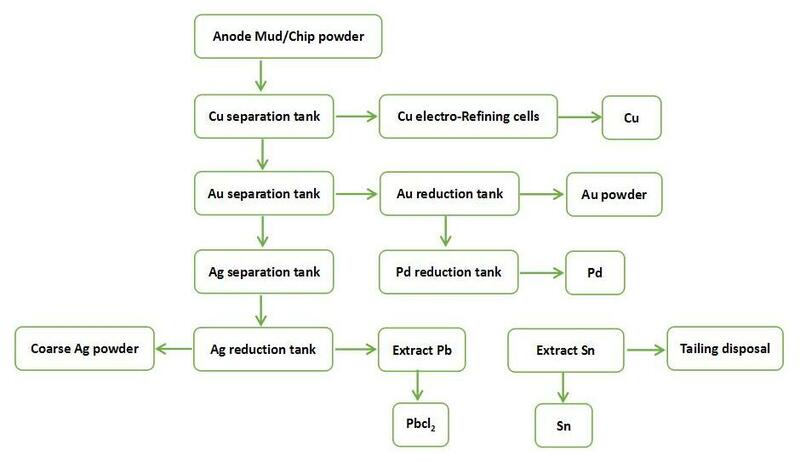 For those chip capacitors with high content silver palladium, it is better to independently use acid process to extract and purify silver palladium, while for those gold-filled circuit board and plug-in components, we suggest to adopt cyanide-free eco-friendly gold stripping agent for fast plating stripping. For the surface containing silver and palladium, metallic packaging triode and integrated circuit, after using specialized cutting machine to chip off the metal shell and get the chips, people can refine the valuable metal according to the chip and integrated circuit solution. For electrolytic capacitor with high aluminum content, through the dry rolling process, workers can directly smelt metallic aluminium after rolling and crushing. For voltage stabilizing diode, some variable capacitance diode, glass sealed element and plastic sealed luminous tube, operators should extract and purify the valuable metal after rolling compaction and squashing. For circuit board, using organic acid can realize circulatory lixiviation and produce electrolytic copper through liquid electrolysis, and for circuit board with palladium (almost all double-faced circuit boards has palladium, and as base material of copper plating, palladium is in guide hole of guide line), it also needs to use acid to lixiviate palladium, then leach and refine palladium.